I woke because I heard the zip on the tent open. I sat bolt upright, who’s that? Tom’s space next to me was empty, and I could see his silhouette through the inner tent. 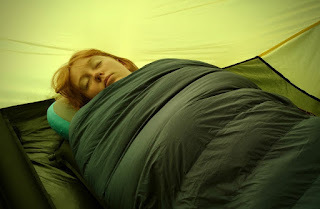 I relaxed back into the warmth of my sleeping bag, content that it wasn’t either an escape bid by one of the girls or a stranger come to tell us we had pitched in the wrong place. I had woken twice in the night, because it was chucking it down. In the morning light, all of our stuff had remained perfectly dry, and for now, it seemed dry outside. Tom was by now rustling in the panniers in the vestibule. Hearing the sleeping mat squeaking against the groundsheet, and knowing that I was therefore awake, he stuck his head back in through the inner to wish me good morning. The girls were still sound asleep. “What are you up to?”, I say, hoping that the rustling is a precursor to breakfast. “I’m going to do some filming and take some photographs,” says Tom. Ok, I admit at this point, I’m a bit disappointed about the breakfast, but so far, this is par for the course. “And I’m going for swim”. Wait a minute. Rewind. What? “You’re going for a swim? Are you crazy?” He grins at me (what kind of an answer is that?) and disappears. As I step out of the tent a few minutes later, I have to admit that the beach is beautiful and the blue water does look inviting. Then I recollect again that we are in the Outer Hebrides, and that inviting-looking blue water is the North Atlantic, and probably freezing cold. Down on the beach, Tom is stripping off. He gestures to me, and holds out the camera. I grab it and point it at him, still wondering whether he is actually going to do this. “Lars Simonsen, this is all your fault!”, he yells, and canters off into the breaking waves (inspired by our Danish friend’s early morning swimming antics on our recent trip to Denmark). He has to run in quite a way before the water gets deep enough for any swimming. Surely he’s going to turn around? No, no, he’s actually in the North Atlantic. I hope the girls stay asleep. I don’t want to have the argument with Ruth which will naturally ensue if she thinks she has missed out on a swim. At the actual beach. The swim is (predictably) quite a short affair, but Tom professes himself ‘refreshed’. He looks chilled through, and grabs a few extra layers before continuing his filming expedition, this time armed with Ruth’s waterproof camera. I go back to the tent, where I can hear the first signs of the girls stirring. Ruth is first awake, and she has remembered exactly where we are and the promise made last night that we would have a trip to the beach in the morning. 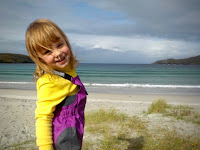 I get her clothes out, strategically handing her the ones she wore yesterday to get sandy, and layering on top her waterproof trousers to try to keep her warm. I leave her shoes and socks in the tent - no point getting those full of sand. Rhoda is next, and then we are off to the shore, ready to play and explore. There is no-one else around, at all. 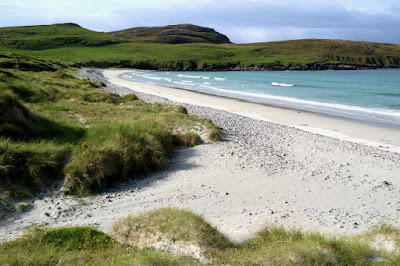 We have the most beautiful beach, right outside our tent door, and it is all ours. 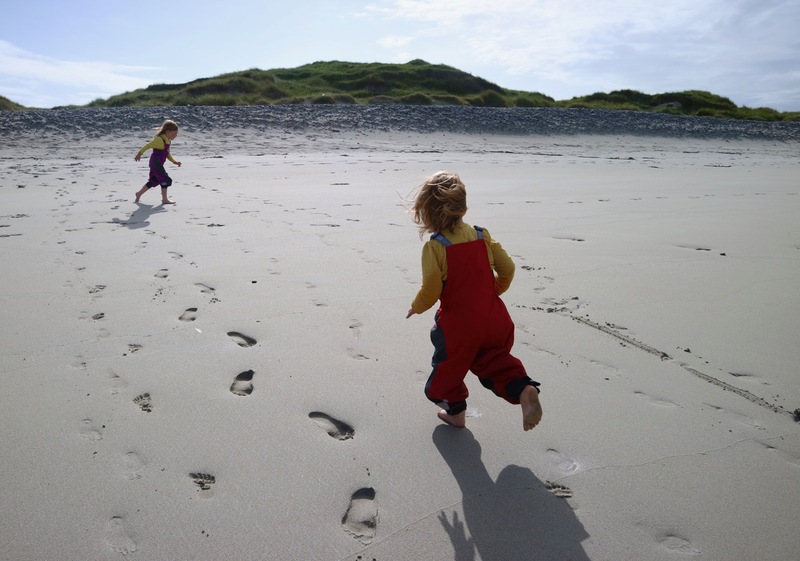 We leave our trail of footprints on the pristine sand, being the first people there. 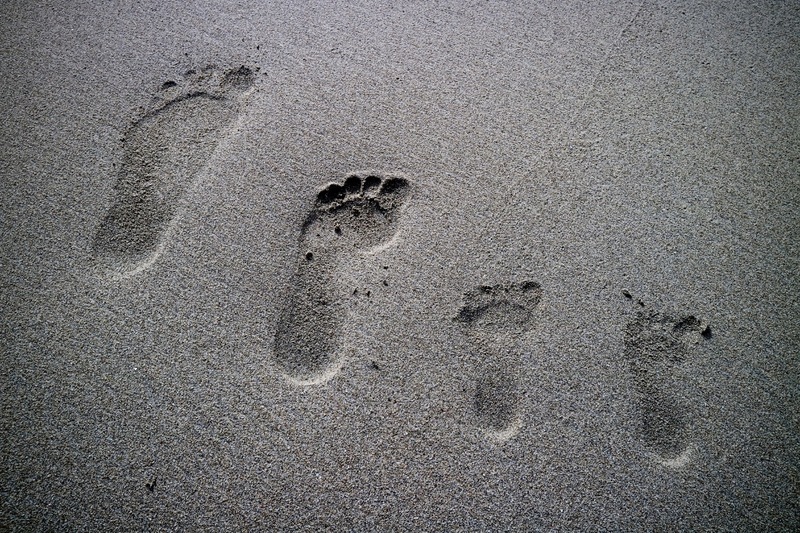 Rhoda’s tiny little feet are dwarfed by the yeti prints Daddy leaves in his wake. We write our names in the sand. We paddle in the little breaking waves at the water’s edge. We look at the seaweed and the shells. It is idyllic. Tom snaps away. And then Tom is fishing Rhoda out of the water. She has disobeyed the instruction to hold hands, jumped over a wave and fallen flat on her face. She’s in no danger, she isn’t hurt, but she is soaking wet. Time for that breakfast then, and a change of clothes for Rhoda! The best of the weather seems to have gone too, and we are mindful that as wild campers, we don’t want to spoil the beauty for others by leaving our tent stuck in the way. The girls are not happy. They don’t want breakfast. They want to play. I bribe them with the promise of stroopwafels and milk, and they reluctantly trail along behind us back to the tent. By the time we have washed hands and feet, eaten and changed Rhoda into dry clothes, it is clear that the good weather is well and truly behind us. The rain has started again. 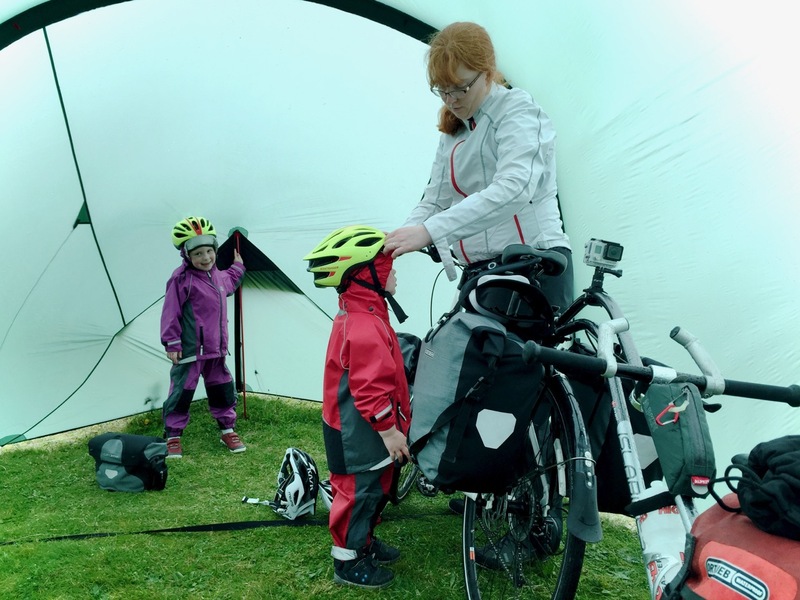 Blast - the tent will now be wet going back into the panniers. I deflate sleeping mats and compress the sleeping bags back into their panniers. The kitchen gear (which Tom 'washed' in the sea) is stowed, and we now can barely move in the tent. The vestibule is full of bikes and panniers. We debate what to do next. We know that the tent’s inners can be stripped out from the fly, and we might get the groundsheet out dry. Is it going to be worth the hassle when we have to reassemble it all? Or is it better to have the comfort of knowing that the inners at least, will be dry when we have to pitch the tent again tonight? The theory is that we can just drop the whole of the tent’s interior, but we have never done it. 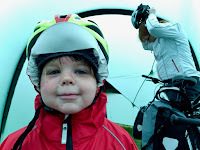 If we accomplish it, leaving just the fly and the poles, we can have everything else packed and hung on the bikes, keeping us out of the wet (and consequently keeping everyone warm) for longer. We decide to go for it. We launch into a sing-song of our anthem for the trip: “Oh, pack it in your panniers” (to the tune of the 'Hokey-Cokey'). 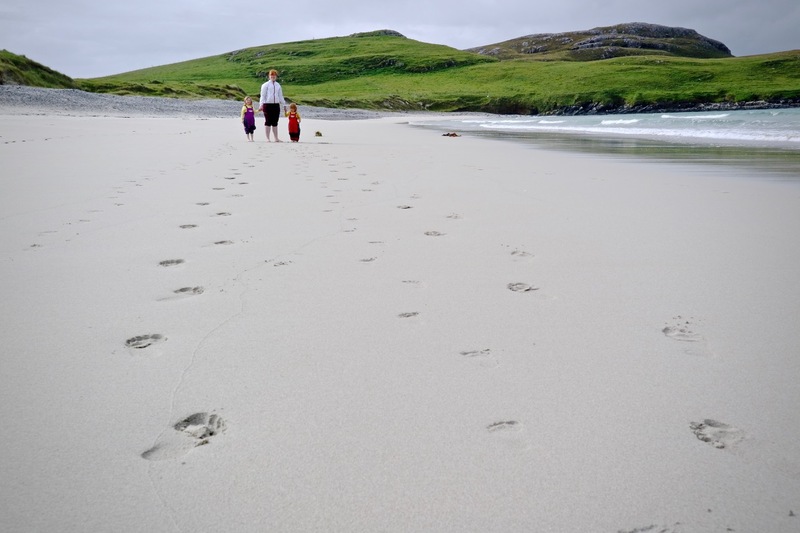 Another of those surreal moments - what else would we be singing on a Hebridean beach in the pouring rain trying to shovel as much as possible away still dry? We pull the ground sheet out…. Contort ourselves to fold it and we shake it all about. With only the poles, pegs and fly sheet left, there is nothing for it but to venture outside. We wheel out the bikes, task Ruth and Rhoda with helping to collect the pegs and set about dismantling the last remnant of shelter. We are wrestling the wet tent when a cry goes up from the girls. They have just spotted Noel, Clem and Steff approaching on their bikes. They have been for a ride to the end of the road, having had lunch and had just arrived for a visit to the beach. 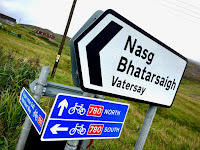 We agree that we will meet them shortly at the Vatersay community cafe next to the beach, where we are about to head for lunch and drinks and leave them to explore. First though, we have an appointment with the end of the road in Vatersay, so that we can say we have ridden the whole way. We are only a few hundred metres short, so it doesn’t take long. The end of the road is not particularly exciting, as ends of the roads go. The road terminates in a T-shape, surrounded by houses and a sentinel telephone box. We turn and head back (checking that Strava has definitely captured the moment - after all, if it’s not on Strava, it didn't happen!) the way we have just come and stop at the cafe. We are struck by what a lovely facility it is for such a tiny island. There are showers, toilets, water and facilities for campers to use, with signage directing those with camper vans to a suitable place to park up. The cafe is lovely and warm, serving a tasty and reasonably priced menu. We haven’t got a huge amount of cash with us (still accustomed to paying by card wherever we go, this is a constant battle for us to remember that paying by card might not be an option out here! ), but we manage to order food and drinks for all of us. Ruth is particularly insistent that she wants soup. She is not disappointed. Steff, Clem and Noel rejoin us just as we are finishing up. We compare notes on our camp spots - we seem to have fared well, as they found their chosen beach quite windy overnight, where we have enjoyed relative quiet (apart from the heavy downpours). 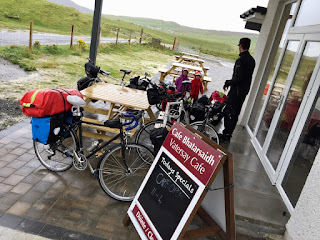 We explain that we are planning to stop in at the Co-op again for food before riding up the west side of the island, and then onwards past the airport to the north of the island to see the bits we missed last time. We agree to ride together, and look in the direction we are about to set off, already knowing that before very long we have to climb back over that rather large hill that we had to push up yesterday, but this time in the pouring rain. Cycle tourists in the rain always elicit sympathetic looks in cafes when they leave. 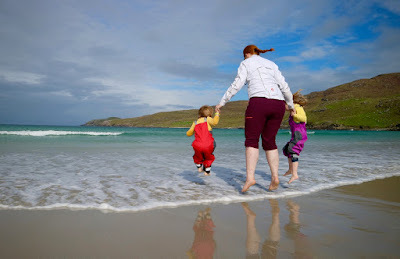 When you have three children in the group, sympathy is mixed with incredulity - “you can’t seriously be going out in that?” We remind ourselves that the rain won’t last forever (especially out here, where half an hour can transform the weather from hideous to gorgeous or vice versa), and zip the children into their waterproofs. We aren’t going to get anywhere if we don’t get going! In spite of the precipitation, the climb doesn’t seem quite as bad in this direction. 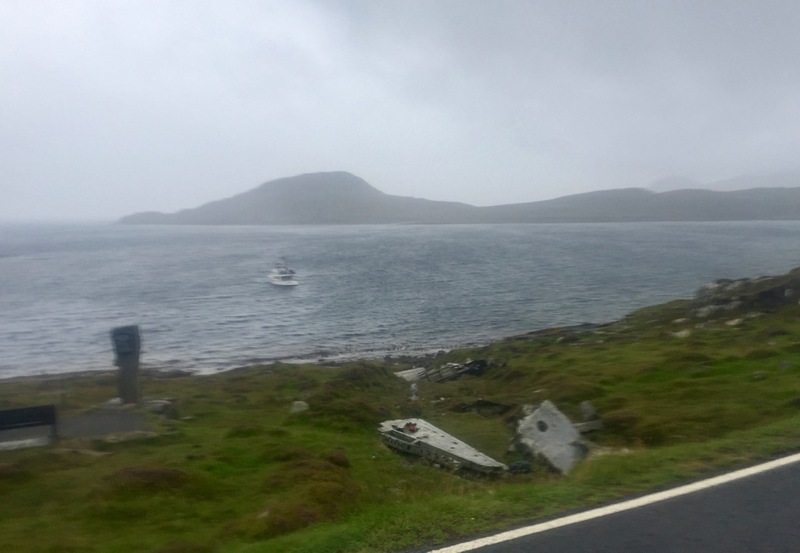 Ruth and I are last up again, having been distracted by passing the crashed plane from WWII on the hillside and views out to sea of fishing boats and little sailing boats bobbing about. The ‘Ruth pedalling while Mummy pushes’ technique is tested again and comes up trumps. 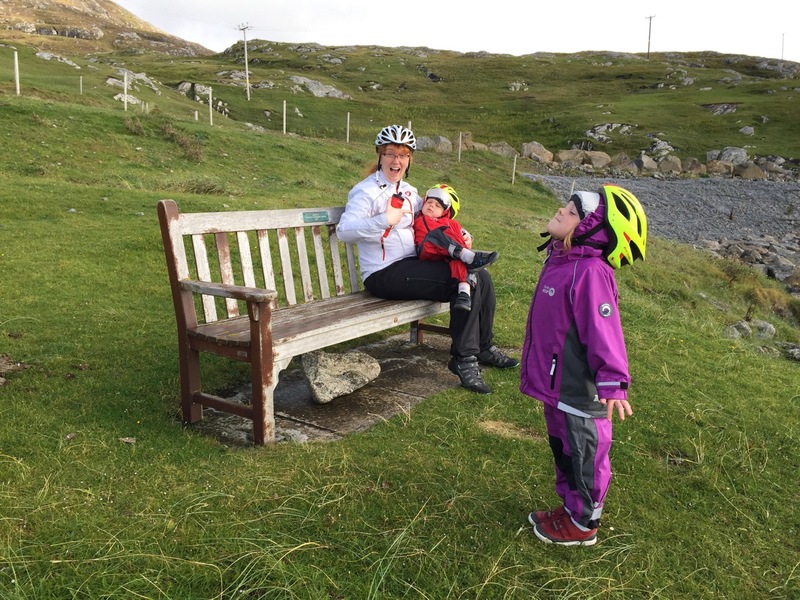 After a quick stop to restock (and obtain more cash) at the Co-op back on Barra, we are soon on our way again. The road is comfortingly familiar from our last visit. A new campsite has opened, but it is only a couple of miles away and we soon pass it, deciding that it is too early in the day to stop. We pass the old Manse that we had looked at sadly last time, apparently still empty. Empty buildings always leave me sad - particularly those that have once been homes. This time is no different - I think again what a waste it is for such a lovely house in such a lovely place to have no family to call its own. 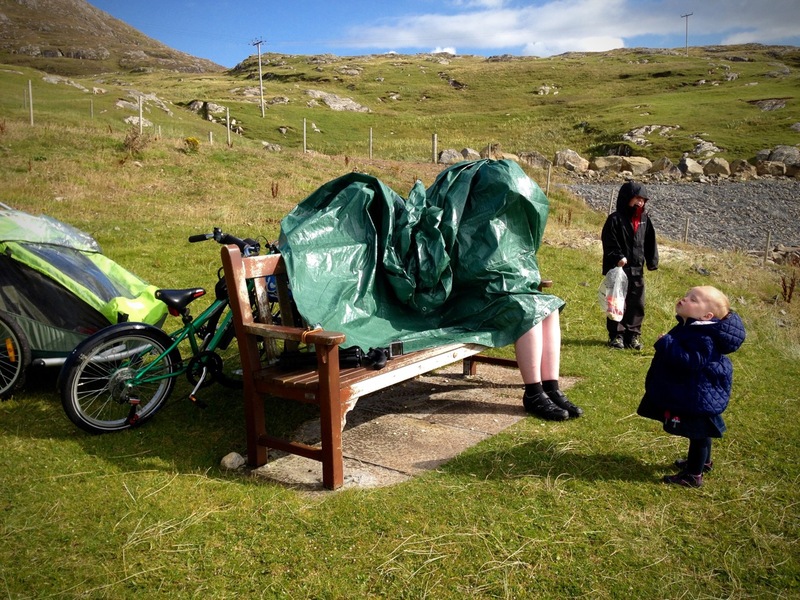 We had our eye on a particular rest spot in any event - the one we stopped at on our last visit where the now infamous 'extreme breast feeding' shot of me feeding Rhoda under a tarp was taken. Last time, we had settled down on a well appointed bench for a snack and a drink and the weather had suddenly turned squally, and Tom had chucked the tarp over me and Rhoda to keep us warm and dry. This time, the weather was improving, when we stopped for snacks and a recreation of the shot. Rhoda is rather larger than the last time! I’m not sure quite what Clem and Steff made of all this -we showed them the original shot so that we didn’t appear to be total nutters. 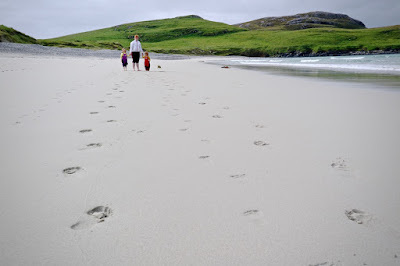 Reaching the turning for Traigh Mhor, we hit the most enormous swarm of midges, turning us into cycling ninjas, swatting them off our skin, spitting and snorting them away and wiping them out of our eyes. Evil, evil midges. Riding through a cloud of them with no warning is particularly mean - for the first couple of seconds I thought it was raining again until the skin on my hands started turning black as the corpses of those that had come into contact with the deet that I had applied earlier built up. Riding along the coast, we hadn’t been plagued too badly, but at the turning for the Ferry, the weather improved and the wind and rain subsided, the midges were coming out in force. We pushed on towards the airport. It was the wrong time of day to see a plane land, but the views were every bit as spectacular across the bay was we remembered. Last time, we hadn’t cycled up this part of the island. Tom and Thomas had had a tour by car from the owner of the campsite we stayed with, and I hadn’t been this far at all. We reached the tiny airport, with its miniature facilities. The baggage reclaim is housed in what can only be described as a bus shelter. 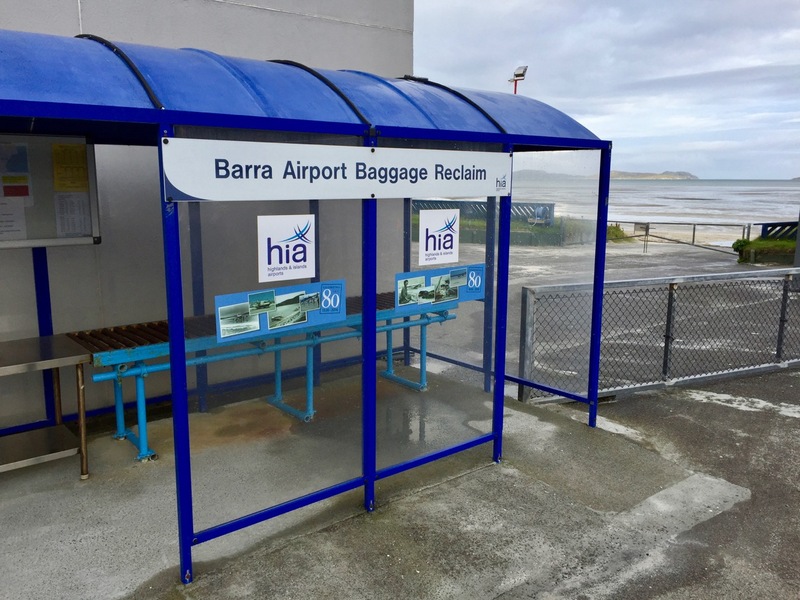 Literally, the bags are passed from the plane by hand to a bus shelter. That is the baggage handling facility. We didn’t have any suitcases, but (possibly taking being likened to luggage on the back of the bike a little too seriously) soon Ruth and Rhoda were taking turns along the baggage belt. We toyed with whether to wild camp, or to go to a campsite. In the end, the soggy start to the day, sandy children and bodies covered in midge corpses meant that the idea of a hot shower and an indoor cooking area won out, so we headed off to Eoligarry and the signed campsite at Croft 1, with the single track road turning into two gravelled ruts as we continued along it. Putting the tent up was a rather more involved affair with the inners detached. While Tom rehung the inners, I slung the tarp over the bikes, as more rain was forecast, but we needed the vestibule space to get our panniers back in some semblance of order after our unorthodox departure. All the pictures are so cute. Good to see that you had a good time with your family. These are the times to cherish forever. All scenes are so beautiful . I m also want to visit such places if I can get one chance in my life . thanks for sharing it ..